What are Non Surgical Hair Replacement Systems? Hair loss can be embarrassing. And unfortunately, it is not something that “just comes along with age”. Hair loss is something that affects many people, both men and women, of all ages. So if this is something that you are experi-encing, rest assured that you are far from alone. Did you know that over 50% of men will experience male pattern baldness in their lifetime? In addition, people around the world are suffering from hair loss due to things like alopecia, hypothyroidism, hyperthyroidism, nutritional deficiencies, Addisons disease, underactive pituitary glands, and even stress (to name just a few). Luckily, transplant surgery is not your only option. We are here to tell you about a non surgical hair replacement hair system that can change your life and give you the answers that you need to your hair loss concerns. What is a Non Surgical Hair Replacement System? Also referred to as “hair systems”, Non surgical hair replacement takes natural human hair and blends it with your own to create a natural looking, full head of hair. Given that the system is “non-surgical”, you no longer need to run the risk of pain or risks during the procedure. Such hair replacement is pain-free, risk-free, and stress free! All systems are custom created to ensure that you get the most natural look possible – people won’t even be able to tell; And the best part? Anyone can do it! That’s right, non surgical hair replacement is a safe and easy solution for ANYONE. Whether you are male or female, 20 or 70 – a hair system can work for you. Whether you are just starting to notice your hair thinning, whether you simply can no longer take your receding hairline, or whether you have lost every strand of hair on your head, these systems can restore the fullness you are looking for. Non surgical hair replacement is quick and easy. The first step? Book a consultation! But don’t book a consultation with just anyone. Remember, your results are only as good as the specialist doing the procedure. At Houghs, we have over 25 years of experience. This means we know exactly what we are doing, and we will deliver professional results every time! In addition, our consultation is free – so make sure you book one today! Once you have decided to move forward with a hair system, we will measure or mould your head, determine your needs, and match your hair colour. From there, we put in the order. Once we get your system, we fit it for you. But we don’t stop there! 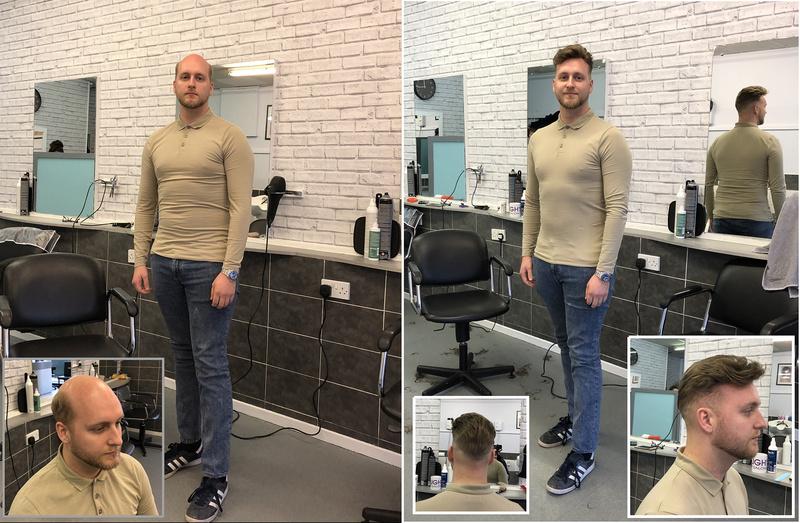 All of our specialists are also hair stylists – so we will make sure you don’t leave our office until you are happy with your fit and your style! Curious about Non surgical hair replacement hair systems? Come on in to Houghs – remember, consultation is free so you have nothing to lose! Come to the experts and remove all the worry.